WASHINGTON (CNN) -- As the first unofficial ballots are cast in the 2012 presidential race, a new national poll of Republicans indicates no clear front-runner for the next GOP White House nominee. A new CNN poll shows 29 percent of Republicans say they are most likely to supporter Gov. Sarah Palin in 2012. It does, however, suggest a clear gender gap. Twenty-nine percent of Republicans questioned in a CNN/Opinion Research Corp. survey released Friday say they are most likely to support Alaska Gov. 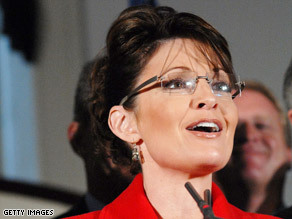 Sarah Palin for the next GOP presidential nomination. Right behind the 2008 Republican vice presidential nominee, and well within the poll's margin of error, is former Arkansas Gov. Mike Huckabee. Twenty-six percent of those questioned say they are most likely backing Huckabee, the surprise winner of the 2008 Iowa GOP caucuses. Twenty-one percent of Republicans polled say they most likely would support former Massachusetts Gov. Mitt Romney, another GOP hopeful from the last campaign who may run again. Nine percent say they would probably back Louisiana Gov. Bobby Jindal, who is considered a rising star in the GOP. On Tuesday, Jindal gave the official Republican response to President Obama's prime-time address to a joint session of Congress. This poll was conducted before that speech. "Since the poll was taken before Jindal's widely-panned speech, his low support is not a reflection on his performance on Tuesday night and is most likely due to the fact that he is not as well known as Palin, Huckabee or Romney, all of whom ran national campaigns in 2008," said CNN Polling Director Keating Holland. Ten percent of those questioned say they would most likely support someone else. While the CNN/Opinion Research Corp. poll doesn't indicate a clear front-runner, it does suggest there's a gender gap among rank-and-file Republicans. "Among GOP men, the same pattern emerges -- no clear advantage for Palin, Huckabee or Romney. But among Republican women, it's a different story. Palin has a 10-point edge among Republican women, winning 32 percent support among them to 22 percent for Huckabee and 20 percent for Romney," Holland said. "With the sampling error, that's not enough to say for sure that Palin is in the lead, but it does indicate that if the primaries were held tomorrow, Palin would have a good chance of being the favorite among GOP women." The poll's release comes as conservatives from across the country are gathered in the nation's capitol to attend the Conservative Political Action Conference, an annual gathering of those from the GOP's right wing. Those attending the meetings are voting in a straw poll for their favorite candidate for the next Republican presidential nomination. The results of the straw poll will be released Saturday. The CNN/Opinion Research Corp. survey was conducted February 18-19, with 429 Republicans questioned by telephone. It has a sampling error of plus or minus 4.5 percentage points.